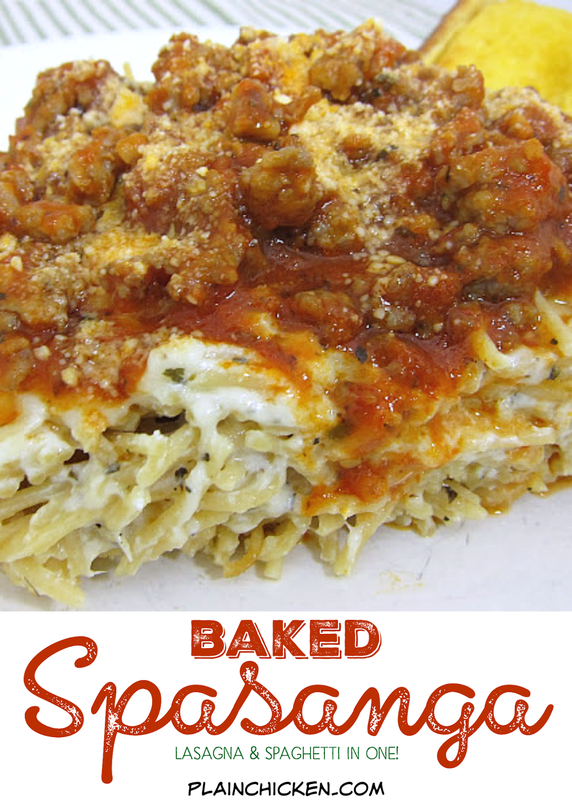 Baked Spasanga - lasagna and spaghetti in one! Baked pasta with mozzarella, ricotta, sour cream, half-and-half and parmesan. Topped with a quick meat sauce. SOOO good! Makes a great freezer meal too. Perfect for a potluck! I came across this recipe on food.com. The description said this was the recipe for a dish at the restaurant Cheddar's. I've never been to (or heard of) Cheddar's, but the recipes sounded delicious. I immediately added it to the weekly menu. This was similar to my Baked Cream Cheese Spaghetti Casserole, but cheesier. It uses 2 pounds of mozzarella cheese. Yes, 2 pounds. I told you it was cheesier! It came together quickly. I mixed the cheese mixture up while the pasta cooked and finished the meat sauce off while the casserole was in the oven. We both really liked this dish. It makes a ton. We made half of the recipe below and it was easily enough for 5-6 people. This would be a great dish for a potluck or any other time to need to feed a crowd. In large bowl, stir together sour cream, ricotta, half-and-half, mozzarella, oregano, basil, pepper, garlic, salt, and half the Parmesan cheese. Add spaghetti and toss until well coated. Pour spaghetti mixture into 9x13 pan lightly sprayed with cooking spray. Top spaghetti with remaining Parmesan cheese. Yum. This does sound and look delish. Never heard of Cheddars either! ABSOLUTELY ADORE CHEDDAR'S !!!! Their Chicken Tenders are outta this world so I know this must be divine ! My daughter loves this at Cheddars. I can not wait to try!! Okay, I want this...like in now...for breakfast! This looks amazing. So trying it. Cheddars is a great restaurant, though I've never had this dish. I'm excited to try it out - it looks soooo cheesy and good! Your recipes always look so delicious!!! Take a trip up to Nashville - Lots of Cheddar's to choose from! And you will love everything you eat there! :)Their baked Spasagna is my favorite! Just went to the store planning to get the ingredients for this dish tonight! Wowzers. All that cheese and everything added up to lots of $$$ just for hubby and I. I'm definitely bookmarking this recipe for our next potluck... but for right now, it's out of my bowling lane. Fanfreakingtastic, Steph! I could just dive into that. I just made a similar version of this last night and posted it. I'm going to try your version as well and maybe make some combinations. Your photos are awesome. Gonna start following you now and also on Pinterest where I found your pins! Thanks for sharing! Hope you can stop by too. Are you SURE its 24oz spaghetti?? I made it according to the directions and needed a 9X13, and TWO 8X8's. That is a TON of spaghetti. There is no way you used that much spaghetti (2 boxes) in your picture. Is this something you could make up and then freeze? I made this tonight, but I cut it down to 1 lb. of spaghetti, 2 C. of Moz. cheese, 1/4 C. sour cream and 3/4 C. 2% milk (instead of half and half). It was still really creamy. I also added 2 tsp. of crushed red pepper to my sauce. It gave it a nice zing. This was great! Yum yum. I used 2 lbs of spaghetti and the cheese called for. Made a meat sauce with 2 jars of sauce and about a pound and a half of ground meat. Great hit with the crowd! Made this tonite, only used 6 cups mozzarella, then added 93/7% ground beef with the sausage for the sauce. I did use 2 (12 oz) boxes of "Smart" spaghetti. It was so delicious and everyone asked for the recipe. This is a keeper for sure. Thanks. I am heading to Publix right now to get the ingredients. Made this tonight and it was absolutely fantastic!!!! I only used a 16 oz package of spaghetti, and I didn't use all the mozzerella because it seemed a little thick. Next time I will make more meat and use 2 jars of sauce. But, this was a big hit with the hubby and my 10 year old. It makes ALOT though, so I may even split it in half next time, or make two 8x8 dishes, keep one and give one away or freeze it. Ate the leftover noodle mixture with chicken parmesan tonight and it was a hit again! Just take chicken tenders, dip in egg wash and then grated parmesan and fry in some EVOO. Once it's done, let it simmer in spaghetti sauce and cover each chicken strip with mozzarella cheese! We have Cheddars here but I have never been there. If they serve what you have here I may have to get my son to take me on my bday or mother's day lol. Looks scrumptious!!! I'm going to mix the spaghetti sauce in with everything else and bake it that way. I think it will turn out fine. Bought the ingredients the other day and can't wait to make it! I live alone, though, and have another casserole to finish before I make this one. I'm already certain I will love it! Oh my gosh, I have been looking for this recipe for for over a year. I made it once and everybody loved it and I lost the recipe. Thank you so much. Making it tonight! I am planning on making this soon. Just wondering, if I half the recipe and make it in a 8X8 dish, should I decrease the cook time? Also, is it too cheesy? Thinking of using less cheese than the recipe calls for. TC - I would still cook it for about 30 minutes even if you half it. I would check it at 25 minutes. It just needs to be heated through and starting to bubble. I didn't think it was too cheesy, but feel free to reduce the cheese to your liking. Enjoy!! I made my own version of this using linguine instead of spaghetti noodles and 16oz filled a 9x13 pan to the top. No way would 32oz work in a 9x13, mine was piled up as is. I mixed the cooked noodles with a mixture of cream cheese, ricotta, sour cream, 8oz mozzarella, parmesan. Put it in the pan then topped with crumbled italian sausage and chopped smoked sausage. then poured pasta and alfredo on top, then provel cheese. Baked 30min with foil on top. Came out good, going to use more seasoning in the cheese mixture next time. Thanks for the concept!! My family LOVES this recipe almost as much as they love my lasagna recipe (which also has a couple of pounds of cheese). Thanks! I made this using spaghetti squash instead of noodles. It turned out great and my super picky daughter didn't even notice the difference. In fact, I am making it again tonight at her request! Thanks for sharing!